‘A folly might be defined as a useless building erected for ornament on a gentleman’s estate’ – Barbara Jones. ‘The mark of a true folly is that it was erected to satisfy and give pleasure to the builder, and greatly to surprise the stranger’ – Sir Hugh Casson. 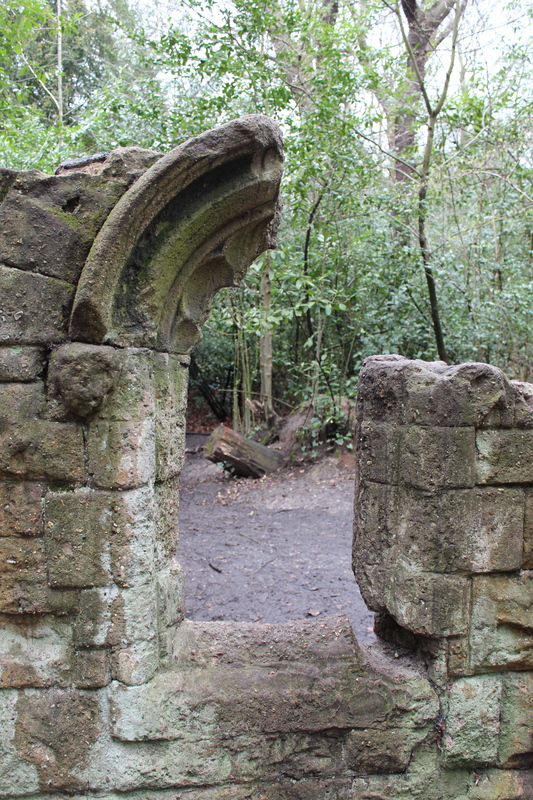 While there is much debate about how exactly to define a folly, there’s little doubt that many visitors must be fooled by this folly in Sydenham Hill Wood. 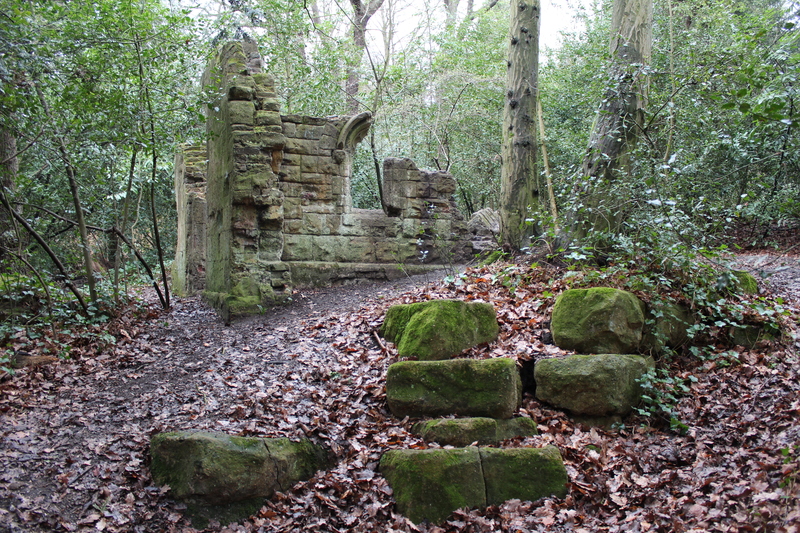 These ‘ruins’ actually only date back to the Victorian era, and were built as an impressive garden feature in the grounds of a large house once on the site – Fairwood, which was built around 1864. Its owner, Alderman David Henry Stone (later a Lord Mayor of London), contracted the firm of James Pulham & Son (inventor of the artificial Pulhamite rock) to construct these sham ruins. Ruins had been a popular type of folly since the late seventeenth and eighteenth centuries, when wealthy landowners inspired by their Grand Tours of Europe wanted to re-create some of the classical sights in their own gardens. 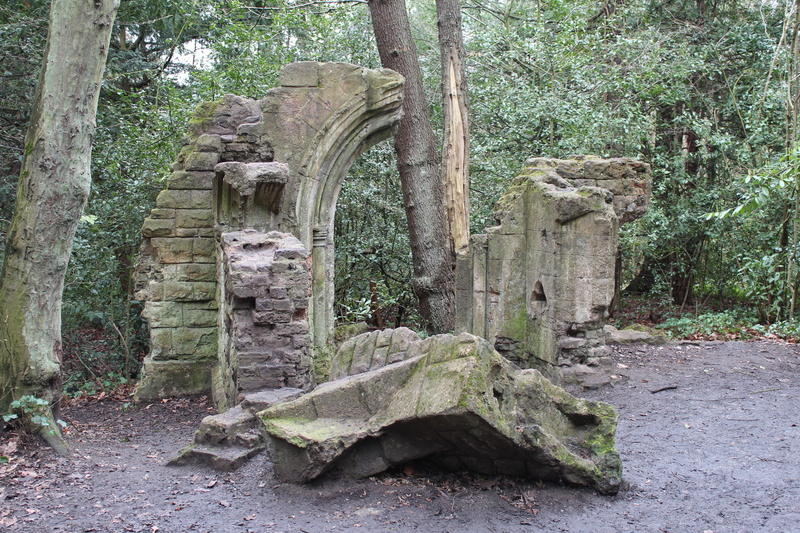 The Sydenham folly depicts a ruined church or monastery – apparently remains of stained glass were still present in the windows back in the 1950s and early 1960s. It’s thought that the arch would once have been complete – although it’s hard to be precise when you’re talking about ruins, and fake ones at that! There are also the remains of a rockery leading down to what was once an ornamental stream. 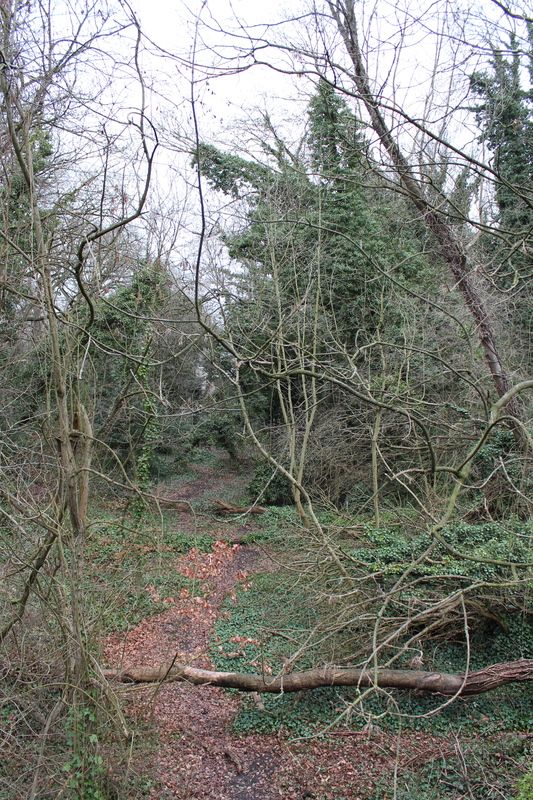 Previously a group of six or seven large houses, including Fairwood, had been built on this 9-hectare site, but these were demolished by the end of the 1970s and the area returned to a woodland state (with a few Victorian era plants thrown in for good measure). It has been managed by the London Wildlife Trust since 1982. Although it was the folly that drew me to Sydenham Hill Wood, this little slice of woodland also has several other points of interest. As difficult as it is to believe given its rather pristine current state, a railway line once ran right through this area – and not just any line, but the Crystal Palace line transporting people from Nunhead to the Crystal Palace. 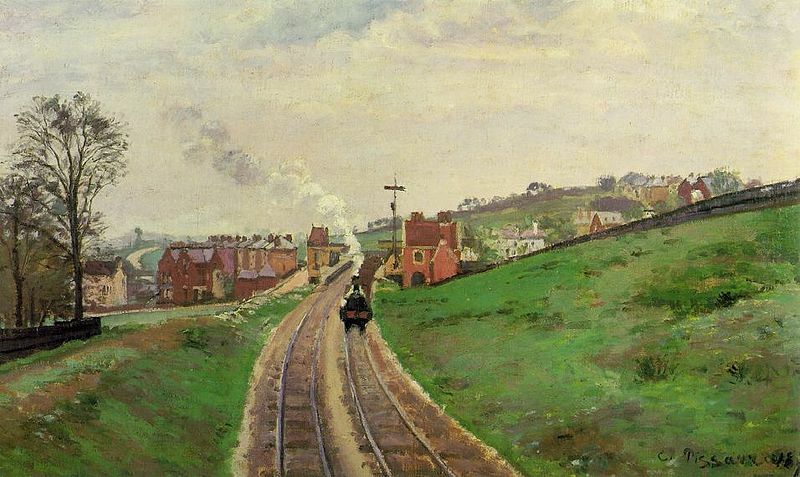 Camille Pissarro painted the view from the Cox’s Walk Footbridge in the wood in 1871 (see picture below left), which looks remarkably different today (below right). You can also see the 1865 tunnel mouth that the railway once passed through – now home to a colony of bats. Much like the story in Vauxhall, this is an open space that has reverted to type, in this case with the wood and its inhabitants reclaiming the space. If you’d like to see more photos of the folly you can visit the Londonphile’s Flickr set.